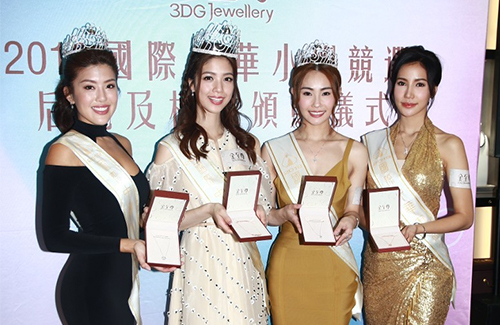 Our newly crowned Miss Chinese International Hera Chan (陳曉華), first runner-up Stephanie Wang (王慧媛), second runner-up Gina Wu (吳雅珠), and Miss Friendship Tevee Meesaeng (鄭子怡) attended their first post-pageant event today, promoting the jewelry brand that had sponsored the pageant. All the contestants went to a buffet together to celebrate the race’s end, and while Hera was unable to celebrate it with her parents, she did receive many congratulating messages. All winners of the pageant would get various prizes, but Hera said she hasn’t thought about how she’s going to spend her prize money. “I don’t even know what I’m going to get, but as for the crown and the staff, I’ll have my parents keep them. It wouldn’t be in the house. First runner-up Stephanie Wang from Hawaii also said that she prefers resting over anything else. After the celebrations, Stephanie immediately went back to her hotel and slept. She shared that she will return home on March 6th, but will be coming back to Hong Kong to attend events.